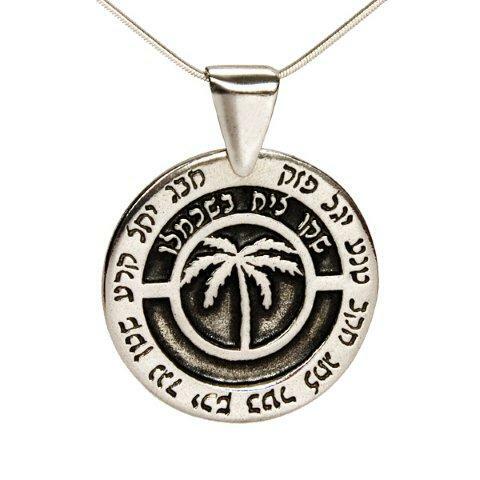 This Kabbalah amulet in concentric circles of Sterling silver symbolizes the wish for plenty, fertility and success. Made by the studio of Ma'ase b'Omanut Jewelry. The wish for plenty, fertility and success unites all of humanity - whether the wish applies for relationships and family or for work and business. This Sterling silver amulet by Ma'ase B'Omanut Jewelers is engraved with many word combinations which in Kabbalah symbolize these wishes. The amulet is shaped as a perfect circle. The outer circle is of smooth silver, deeply etched with twelve meaningful Kabbalah acronyms which show in a darker silver. The next circle is itself in darker silver with a micro hammered texture, with three word combinations in relief in smooth silver. Further in is a perfect circle with no writing, attached to the outer circle, all in smooth shiny silver. The innermost area of the amulet is a round full circle of hammered dark silver, with a relief representation of a palm tree. The palm tree is considered extremely efficient: The fruit is usable for eating, the pits for fuel, the branches for shade and the trunk for building - all in all, in itself a symbol of plenty and fertility. The amulet is securely hung on a sterling silver necklace with an upside down cone shaped link in the same smooth shiny silver as the outer part of the amulet. This amulet by JewelryTale Jewelers has a diameter of 1 inch (25mm).